The Doors Live At The Bowl '68 is widely held as the band's best performance ever captured on film. Now for the first time fans can watch the complete version in digitally re-mastered glory with 5.1 surround sound as the entire concert has been carefully restored from the original camera negatives to include the lost performances of Hello I Love You, Texas Radio and the Big Beat and Spanish Caravan. The film opens with a special feature of interviews with the band talking about what it meant to perform at the Hollywood Bowl and the enduring significance of this concert. More than 40 years after their debut album, The Doors' music and legacy are more influential than ever before. 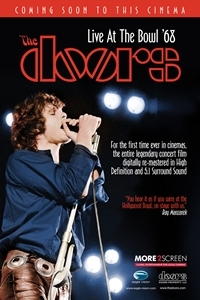 Though they've had scores of imitators, there's never been another band quite like them and this film will appeal to their many fans -- both their original followers and a younger generation discovering The Doors now.